Let a Thousand Arpaiovilles Bloom! In my active fantasy life (category: immigration enforcement), happy musings often start with Sheriff Joe Arpaio and his low-rent tent city jail located in Maricopa County, Arizona. Not only are illegal aliens and other perps housed in bare-bones tents, they are issued old-fashioned striped prison uniforms (no worry about self-esteem evidently) and pink underwear. 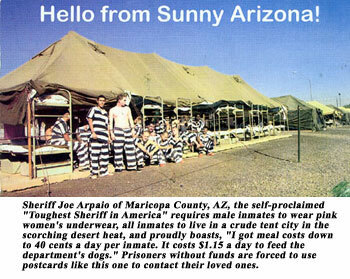 Sheriff Joe brags on how little he spends on prisoners' chow, just 40 cents per day. Furthermore, Sheriff Arpaio believes that punishing lawbreaking illegal aliens has a deterrent affect. Imagine that. Since US detention facilities are likely a big improvement on the housing many Mexicans came from (despite the recent wailing of immigration anarchists about workplace arrests), it only makes sense to make jail less appealing than home. Otherwise, foreigners might not be properly deterred. Anyway, I was cheered to read about a souped-up tent city built by the feds. RAYMONDVILLE, Tex. — Ringed by barbed wire, a futuristic tent city rises from the Rio Grande Valley in the remote southern tip of Texas, the largest camp in a federal detention system rapidly gearing up to keep pace with Washington's increasing demand for stronger enforcement of immigration laws. That's way too expensive for this facility to be consider a real Arpaioville, but it does show that Washington can deal with open borders when it makes up its mind. The bad news is that the recent surge of enforcement has been part of the Bush strategy to demonstrate that he is doing arrests for a couple months so it's cool for Congress to vote for an amnesty. To do so, the government must convince skeptics that it can credibly enforce laws aimed at illegal immigrants and their employers, and can hold and deport those caught by the U.S. Border Patrol. There's a difference between the ability to do something for show and the political will to maintain an activity 24/7 for decades. The voters know that, and most don't trust Bush a nickel's worth. But back to my original point, Arpaiovilles can indeed be a helpful bit of strategy in the war to save America.